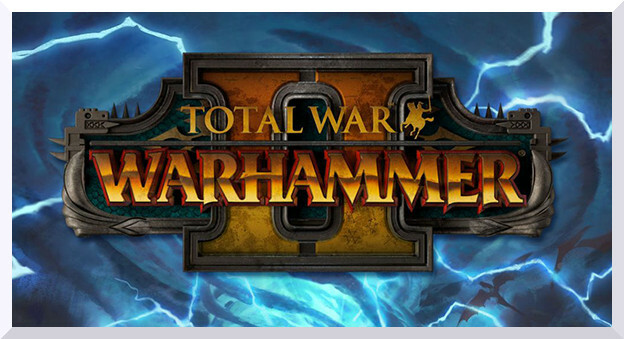 "..Warhammer 2 it has all the hallmarks of a truly great game. It is an excellent sequel in every sense of the word; it improves upon the originals shortcomings, expands the setting and as different as any Total War game can be from another Total War." 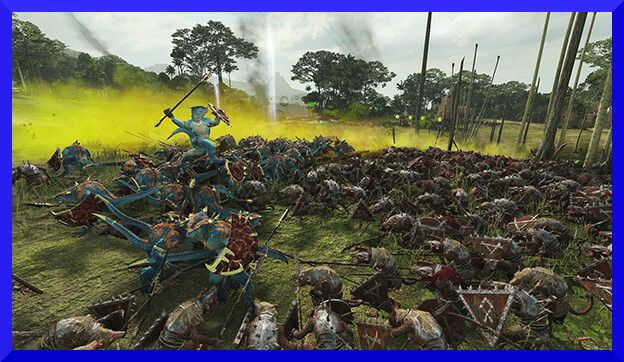 Warhammer 2 review by Mhaedros Total War Warhammer released in 2016 to a pretty good reception; while some took issue to the fact that the series was moving away from historical settings - for the time being - others relished in the fact that this long rumoured, seemingly impossible game was finally being made, not just into one game but three full standalone games. 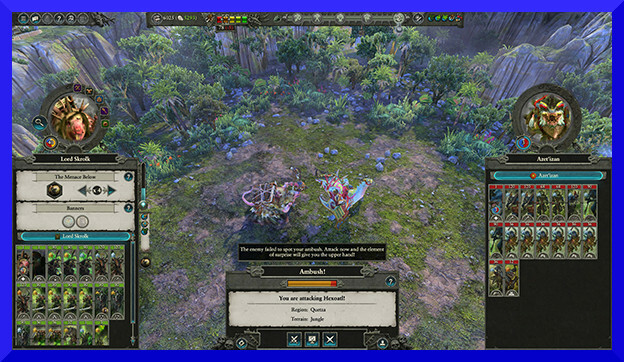 The original Total War Warhammer focused on the Old World, the homeland of the Dwarfs, the men of the Empire, the cruel and cunning Vampire Counts, the savage Orc tribes of the south and the ruinous hosts of Chaos, later adding the murky kingdoms of the Wood Elves, the primitive but fierce Beastmen, the chivalrous Bretonnians and the Chaos worshipping Norsca. Total War Warhammer 2 leaves the shackles of the Old World behind and travels further west, spanning not one but four continents. To the north is the ragged and ravaged icelands of Naggaroth, where the Dark Elves rule under their evil Witch King Malekith, and his mother Morathi. To the south of Naggaroth is the vast jungle continent of Lustria. This place is inhabited by the Lizardmen, sworn enemies of everything Chaos, and in the temple city of Hexoatl rules Mazdamundi, one of the legendary lords for this faction. All is not well in Lustria, however. The council of the Thirteen, the great rulership of the Skaven Underempire have sent Skrolk and his clan of Pestilens to conquer this place in the name of Skavenkind. Also lurking here is the Order of Loremasters, a High Elven expedition led by the prince Teclis. Travelling east from Lustria you reach the Southlands, which to a degree played a part in the first game. Here are the vast deserts of Araby, currently settled by Bretonnian crusaders. Here the Last Defenders, a faction of Lizardmen led by the legendary warrior Kroq-Gar, try to restore order to a warring continent. The Skaven Warlord Queek Headtaker also dwells in these parts, always scheming and backstabbing to further his own interests. To the north of the Southlands and east of Naggaroth lies the homeland of the High Elves, the fortress island of Ulthuan. Here the legendary lord and renowned warrior Tyrion does his all to defend his homeland against Dark Elves, Chaos, Skaven and anyone else who might attempt to overthrow High Elven rule on Ulthuan. The bugger with the flaming sword is lord Tyrion. Apart from these eight legendary lords spread around the world, Malekith, Morathi, Mazdamundi, Kroq-Gar, Tyrion, Teclis, Queek and Skrolk, there are obviously hundreds of regions and dozens of factions, including several Old World races. There are Vampires along the coast of Lustria, Human colonies fighting for a foothold, stalwart Dwarfs fighting their old enemies the Orcs, Bretonnian crusaders in Araby and hordes of Beastmen and Chaos spawn roaming and pillaging. The world of Total Warhammer 2 is not only larger in scope, then, but also more diverse. Wherever you go, you will find new and unique enemies to kill, eat, enslave or sacrifice, depending on your race, playstyle and mood. Whereas most of the game still functions the same way Total War Warhammer did, there are some tweaks and improvements it really benefits from. The campaign, while still using major and minor settlements to make up a region, is vastly improved by the removal of region types only certain races can conquer. Instead a climate system has been introduced, where every race has a set of climates it will thrive in. Lizardmen really like their jungles, for example, but don’t like to live on islands or mountains. High Elves on the other hand are a seafaring people, with lots of benefits from living near the oceans. If you've played Total War before (Which you have, let's face it), most of this probably looks familiar. This means that while you are punished for pushing too deep into unsuitable climate, you never end up in a situation like the original Total War Warhammer, where playing as Vampires of the Empire meant that completely destroying the Orcs and Dwarfs was more a matter of getting past the attrition than any kind of strategic play, since you could never capture their cities and your armies can only be reinforced in owned regions. 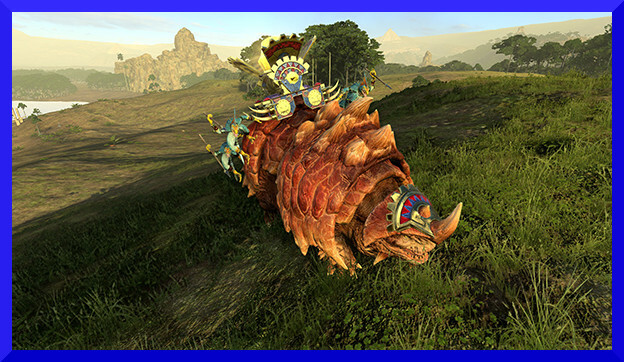 Total War Warhammer 2 solves this in a way that still leaves every race distinct, while making it less like a chore to fight faraway factions. Maybe the biggest change from earlier entries in the Total War series is the addition of a story led main campaign, the Vortex campaign. This means that while most of your time will be focussed on Total Warring your neighbours, you also have to pay attention to a little progress meter at the top of the screen. Every major faction is in a race against each other to gather their own unique resource and complete a set of rituals in order to either strengthen the Great Vortex at the center of Ulthuan, or destroy it. To complete a ritual you need to gather enough of your race-specific currency. The Skaven use warpstone, while the Lizardmen gather ancient plaques. A ritual takes ten turns to complete, and in this time you will gain some monetary and public order bonuses, but it also makes you a target. 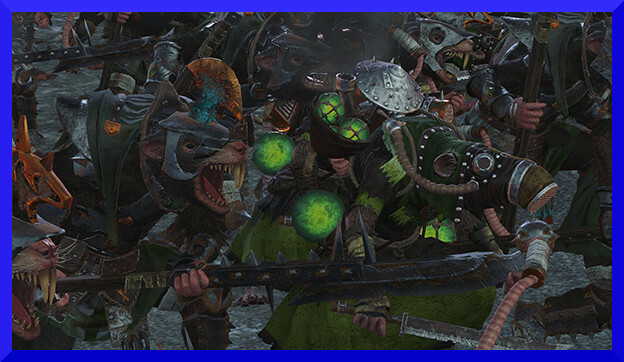 Rival factions can send armies to your cities trying to stop the ritual, and the game will spawn Chaos and Skaven hordes in order to cause you some trouble. This means you always have to be prepared to defend your settlements before trying to further your cause. Every race has access to a number of rites, which usually gives you a short or long term bonus on the campaign map in exchange for one currency or other. The Skaven for example can get access to Dooom! Engineers, who can destroy city walls, or Plague Monks who, well, spread plague. The Dark Elves on the other hand have access to the Rite of Mathlann, which allows them to recruit a Black Ark, a massive floating fortress island. A Black Ark, one of the floating fortress island of the Dark Elves. The campaign in the first Total War Warhammer was very good, but the campaign in Warhammer 2 is truly excellent. 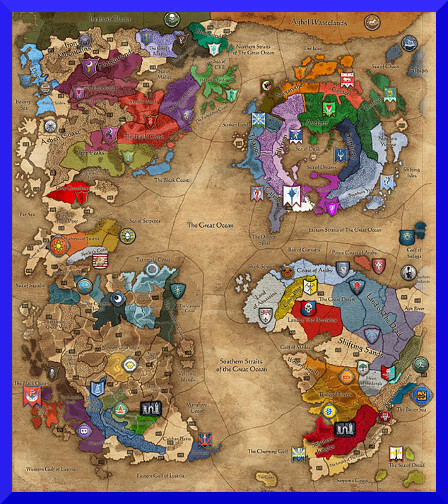 A number of smaller and larger improvements just make it a joy to play, and since every continent is so different, the different campaigns truly feel unique, even if you play as two different lords of the same faction. 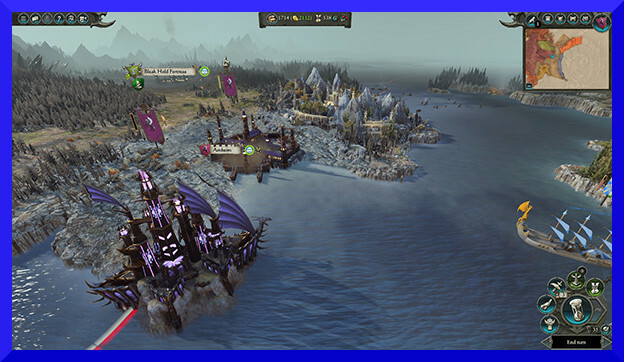 A month after Total Warhammer 2 came out, the Mortal Empires campaign was released for free to owners of both Warhammer and Warhammer 2. This extra campaign merges the two campaign maps, making it possible to play as any faction from the two games in a massive campaign map. This, truly, is the way the games were meant to be experienced, together and all races fighting each other. 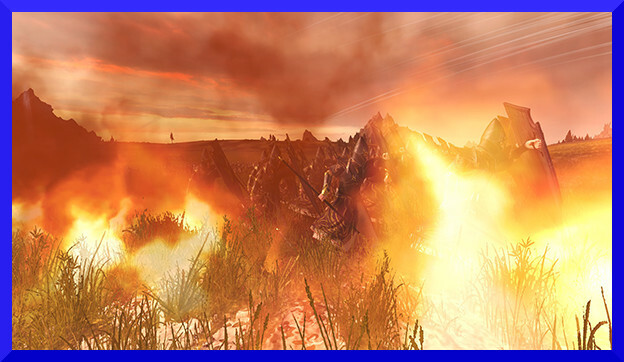 As well as the factions from the new game, it also brought all the improvements from it to the Old World, so it uses climates instead of the old race-specific regions. A High Elf and a Dark Elf dancing the dance. 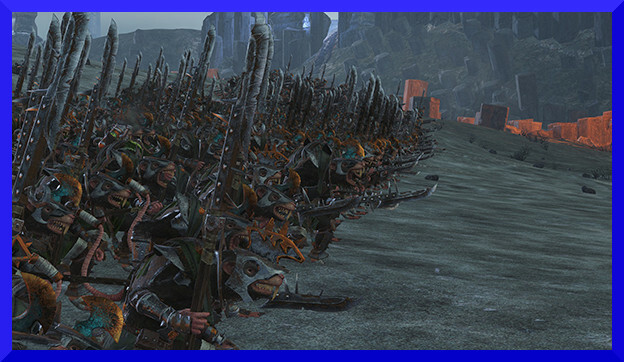 A staple in Total War Warhammer was how different each faction played, on the campaign and in the battlefield. This is very true for Warhammer 2 as well. While some factions focus on heavily armoured, well trained soldiers holding the line, others are more chaotic and try to overwhelm the enemy by sheer numbers alone. The High Elves might seem noble and righteous, but in reality they are a scheming bunch. 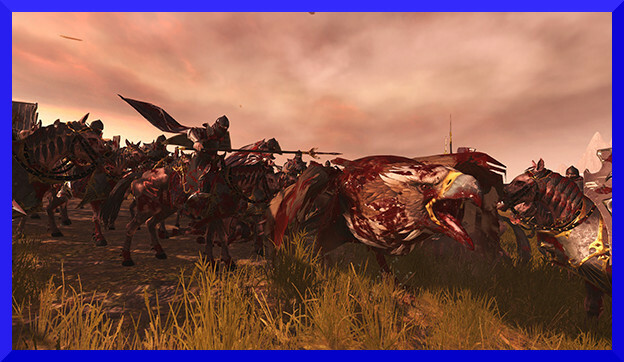 Their armies consist of well trained archers and infantry, with some excellent melee cavalry and mounted archers, artillery and chariots, as well as a backup of phoenixes, eagles and dragons. To top it off they have mages with access to the lores of High, Light and Life, mostly focussing on buffing and replenishing your own units rather than outright destruction. 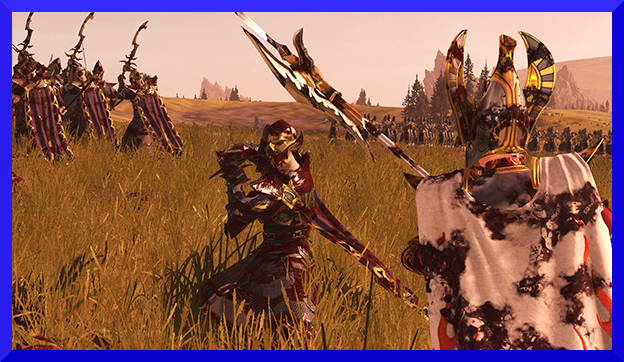 They are probably the most average, jack of all trades faction Total Warhammer 2 has, with an emphasis on quality over quantity. On the campaign map the High Elves have a lot of useful skills relating to diplomacy. Entering into a trade agreement as the High Elves instantly gives you a full view into everything the faction you are trading with sees; you see their regions and their armies, giving important strategic information about potential allies as well as foes. As well as information, the High Elves can deal in intrigue. You can improve relations between different factions, or indeed destabilise their friendship. You can make allies enemies with a whisper in the right ear, or make enemies become friends. This function is very interesting, but it is unfortunately somewhat limited in its scope; you can choose which two factions to improve or worsen relations between, but rarely does your decision have lasting impact. Dark Elf Dreadspears having fun. The Dark Elves, the sadistic outcasts of Elven society have spent several lifetimes being angry over past wrongs, share a quite similar army to their High cousins, though they prefer crossbowmen to archers, and generally are more focussed on aggressive units like the Witch Elves or Black Guard of Naggarond. Being evil megalomaniacs, the Dark Elves really like slaves, so much so that after every battle you get the option to enslave your enemy. This plays an important role in the economy, as the more slaves you have in a region, the more money that region makes. Of course, you can also use them as sacrifices to get a short or long term bonus with one of the Dark Elf rites. As mentioned earlier one of these rites allows you to recruit a Black Ark, one of the things that makes the Dark Elves so interesting. "Look Malekith, we found a pet can we keep him? Pleeeaaaase!" The Black Ark is basically a fleet, that can be upgraded with the same buildings as a normal city. It can recruit units and nearby generals can even recruit units from it. While in range of a nearby battle, it can also give support in form of magic barrages, raining death upon the enemy in battles. The Lizardmen are, as the name might suggest, a bunch of somewhat humanoid lizards. Fighting for the cause of the Old Ones, gods who visited them ago, they seek to protect the world from Chaos and evil. In theory then, this makes them the Good Guys of the world, but sometimes the lesser races just need to be taught, by which I mean exterminated, if they stand in the way of the greater good. Have they no respect for our boys in blue? Their armies consists of skinks, the smallest and weakest type of lizardman, who are usually used as skirmishers or mages and Sauruses, who are the warrior class, strong and mighty, but not with a lot of armour except their scaled skins. Being lizards, they also have a strong affinity to dinosaurs, onto which they often put laserbeams. They have access to quite a strong roster of dinosaur riders as well as flying Terradon riders, but lack larger flying units. The main bulk of the Lizardmen army has quite a lot of armour and is fairly disciplined, but under too much pressure the units will break; and when a Lizardmen unit breaks it usually will not run, but rather frenzy and fight uncontrollably. For the larger monster units, this can often lead to some friendly casualties. On the campaign the Lizardmen have access to the Geomantic Web, which links a series of regions across the map. The Web can be improved by certain buildings and by owning several linked regions, and will grant better commandment bonuses depending on the level it is at. The Skaven are arguably the most interesting race to play with. They have access to some extremely cheap canon-fodder and can easily field several armies very quickly in the campaign, in order to overwhelm enemies. Friendly fire is not an issue for them. As well as some very cheap, quite poor units, they have interesting technologies that give them a few glass canons as well. The warpfire throwers will light the battlefield in green flames, burning friends and foes alike. They have maybe the most devastating artillery in the game, like the Warp Lightning Cannon, which, well throws lightning at the enemy, as well as some of the most horrible monsters, like the Hell Pit Abomination, a huge mutant creature created only to destroy. Some elite units also exist, like the Stormvermin, the most ably trained unit of Skavendom, and Plague Monks, who spread death and corruption in the wind. The Skaven also have access to the destructive lores of Ruin and Plague. Lovely Ratboy Stormvermin with lovely halberds and lovely spiked helmets. Wherever the Skaven go, they spread Skaven corruption. Whereas other races that spread corruption, like Chaos or the Vampires, thrive in it, the Skaven do not, and in fact their controlled regions become less and less happy the more corruption they have. This forces you to play aggressively, always moving forwards and taking on new foes. The corruption is not entirely bad for you, however, as it allows you a certain number of free units in every battle. At any time, anywhere on the map, you can choose to send in a free unit of Clanrats. This is excellent for occupying enemy archers or simply providing canon fodder for more valuable units. The Skaven also have a food system, where you always need to make sure your empire does not starve. You can gain food by fighting enemies and from certain buildings, but often this still is not enough, and you will have to deal with faction-wide penalties, like lower loyalty for generals, lower public order and lower morale in battles. Having too much food, on the other hand, means you can use it to instantly upgrade occupied settlements to a higher level, meaning you do not have to wait for the population to naturally increase. This means you get to make the choice between keeping your populace happy, or expanding more rapidly, both of which have their upsides. As well as this, you can use the food before a battle to increase the number of free Clanrat units you get to bring into the battle. "A clanrat, a gutterrunner and a death globe globadier walk into a bar.."
Total War Warhammer was a very good game, but playing Warhammer 2 it has all the hallmarks of a truly great game. It is an excellent sequel in every sense of the word; it improves upon the originals shortcomings, expands the setting and as different as any Total War game can be from another Total War. The addition of the Mortal Empires campaign and the races from the first game is just the cherry on top of the pie; the Warhammer trilogy might just end up being the best Total War there has ever been. 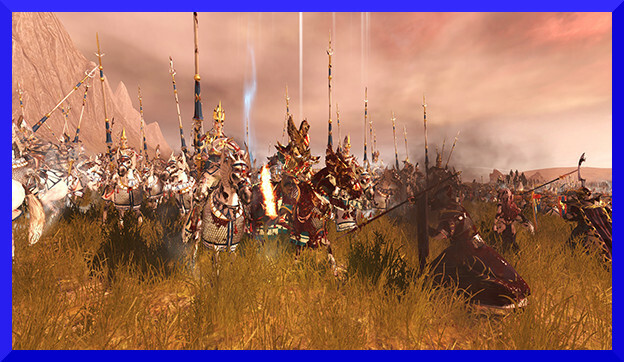 We very much thank Mhaedros for joining us as a guest writer with his review of Warhammer II; me not being a fan of the serie I must say he almost covinced me to try it, if the review could only be a bit more .. lovely..
Well done review .I really liked it .The funny captions under each picture are like a cherry on top of the cake . 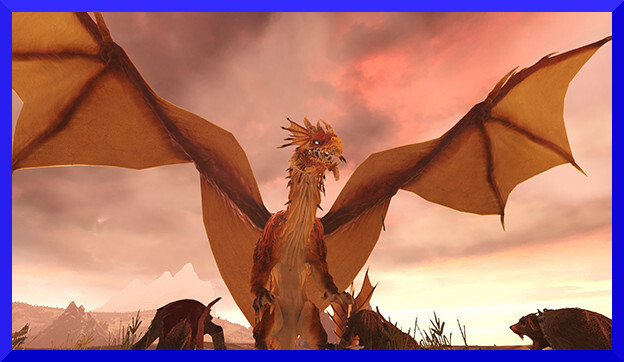 Great review, Mhaedros, with an excellent and in-depth introduction to the different factions and their mechanics. I enjoyed the images and the humorous lines, too! The rituals mechanic sounds like a good way to add interest and challenge to the mid-to-late campaign. The image showing the Black Ark - and the campaign map, including seas - made me wonder about the representation of sea warfare in Warhammer II. (I don't have a computer powerful enough to play the game, unfortunately, so I can't simply start a campaign and find out.) 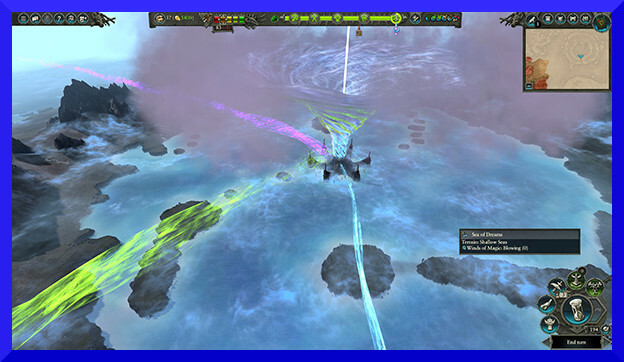 I get the impression that naval warfare exists in Warhammer games and that it's auto-resolved, is that right? Great review,i have not bought the game yet as i just could not really get into the first,i tried but it just did not grab me.I have an interest in the warhammer world due to the fact i enjoy reading the books but not playing the tabletop,the tabletop did not grab me either although i tried a couple of times with a cousin who loves to play and paint the figures. I guess I'll have to start a campaign at some point. Haven't touched the new extended map yet. Thanks. It somehow had slipped my mind that this game came out. Now I must obtain it! Any idea if it supports Mods? I've been on a mod kick ever since I started using ModDrop and Warhammer seems like the perfect thing. The Steam Workshop is filled to the brim with all kinds of mods; The only potential issue is that mods have to be made compatible with every DLC and update, but the game launcher is actually surprisingly good at figuring out out-of-date mods, and which should work with the current version of the game! There's all kinds of things, like visual improvements, new units and improved mechanics.